Flat Rock High School "Wildcats"
Flat Rock (population 415) sits in southeastern Illinois in southeastern Crawford County. Illinois Route 1 leads the way to and from Flat Rock. The Prairie Central Railroad runs through town as does a branch of the Brushy Creek.. For reference on a map Flat Rock is located about 6 miles west of the Indiana state line, 10 miles north of Lawrenceville and 11 miles southeast of Robinson. 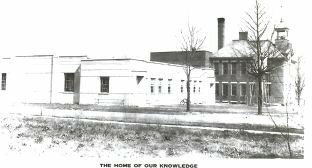 "I am not sure when the first school was built, probably in the middle 1800s. The school was a two-story frame building. In 1908 they moved the old building and put up a new brick building on the same site. It had eleven classrooms, all twelve grades were taught there. In 1939 a gymnasium was added. 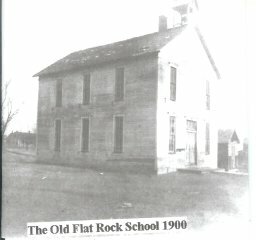 Flat Rock High School was a three-year high school until 1925. If a student wanted to attend a fourth-year of high school they had to continue on to either Robinson or Lawrenceville. Flat Rock High School competed in football and basketball. Our school building served as a grade school until it was closed in 1986. The building is still standing, but is not currently used. The gymnasium is sometimes rented out, and Halloween parties are held there each year." The photos found on this page were sent to us by Shirley Rich and are from a group in Flat Rock called Pioneer Families. Two books regarding the history of Flat Rock have been written by the members of the Pioneer Families. They are titled "Flat Rock Memories Volume 1" and "Flat Rock Memories Volume 2". The Flat Rock school building pictured at the top of this page met a sad fate. The building was demolished in the summer of 2009. An article regarding the demolition from 2009 was provided by Owen Pulver. School Fight Song: "Flat Rock Loyalty"
Victory from you Flat Rock High! Flat Rock High School, as mentioned above, definately offered boys basketball and football. If you have any information you would like to share regarding the athletic success of the Flat Rock kids please forward it to us so we can share it with others. 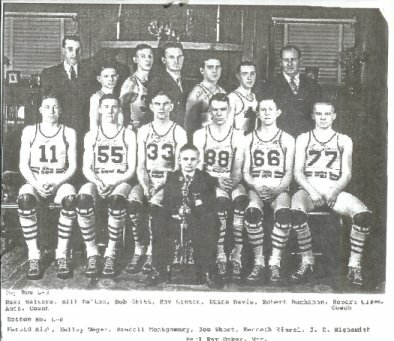 The Flat Rock boys had a nice mini-streak in the late 1930s. The years of the two District Championship teams are listed below. Unfortunately team records and coach's names are not available. We are told that before the gymnasium was built in 1939, the Flat Rock High School boys played in a place referred to as a "sheep barn". We don't think it was a nickname either, it was probably a real sheep barn, as many schools in the early 1900s played in! 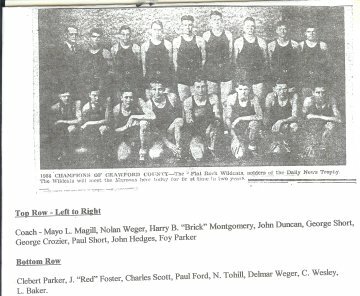 "Flat Rock turned out in style last night to honor their 1933-34 edition of the Flat Rock Wildcats, winners of the Daily News Championship trophy for Crawford County, which was presented to them last night at a banquet sponsored by the Business and Professional Women's Club of Flat Rock. One hundred and thirteen plates were set around the banquet table with all the county teams being represented. The Lawrenceville Indians with the coach were also present at the celebration. The principal speech of the evening was made by Pete Ellis, Sports Editor of the Vincennes Sun-Commercial. Ellis compared basketball in Indiana with the brand of Illinois ball, saying, "Indiana has always claimed to play a better brand of ball but I do not believe this to be true at present. The style of ball now played in Illinois is equal to Indiana." In closing he stated, that he "would like to see the basketball champions of each state meeting in a post season affair." Several scores involving Flat Rock High School were found on a website titled "Illinois Postseason Basketball Scores." These scores are posted below. Bellmont lost in 2nd Rd. **Final game for Flat Rock High School boys basketball. Flat Rock High School closed in the summer of 1949. The Wildcats had an excellent football program through the early 1920s and 1930s. We are searching team records. 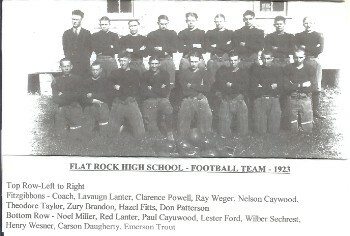 The photo of the grid iron warriors to the right is of the 1923 Flat Rock Wildcats. If you right click on the photo you will view an enlarged version. "My father, aunts, uncles and grandparents all attended Flat Rock as well as my mother in-law. However, they only attended the elementary school. Many people forget that Flat Rock had a high school. From listening to the older adults in my family talk, Flat Rock was once a town full of life, businesses, and pride. When the school was closed in 1986 the town also began to slowely die. I am only twenty-three years old and the grade school closed the year before I was born, other wise I would have attended there as well. I remember going to birthday parties, 4H dances, and playing basketball in the Flat Rock gym. The school and gym could be rented out until it was condemmed in 2009. Just two weeks ago they tore down the old school." "It is sad, but it needs to go," said Peggy Wesley as she watched Monday morning's demolition of the Flat Rock Grade School. After years of sitting empty and infrequently used, the school building and gymnasium are finally coming down. Demolition workers started removing windows and other items from the old school last week. Heavy equipment began bringing down the building Monday morning. The demolition will be considered a "wet demo," with water being used to keep dust and any hazardous material, such as asbestos, out of the air. The air will be monitored for quality throughout the process. 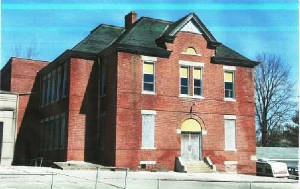 The school was built in 1908. The gymnasium, which was used as a community center until recent years, was built in the late 1930s. High-school students were moved to Robinson after 1949, but elementary classes continued to be conducted in the building until 1986. "The elementary school is staffed with nine teachers, providing educational opportunities for pupils from kindergarten through eight grade - with an enrollment in excess of 200," the article said. "A gymnasium is attached to the school. An excellent hot lunch program is maintained. Music is taught in all grades and craft and home economics in eighth grade. An active Parent-Teacher Organization is maintained. This organization sponsors a year-round scouting program and a summer recreation program." The school facility was vacated in 1986, but concerns over asbestos lingered. The village had tried to lease the facility for office space unsuccessfully. The gymnasium was used as a community center for several years until it was condemned a few years ago. The Susie Wesley Memorial Library was also in the building for a time. In 2001, Flat Rock Village Board President Forest Singer said the major goal for the year was to tear down the school and leave the gymnasium as a community center, but the project remained in limbo. At the time, board member J. D. Branson said there was one major asbestos problem around the plumbing in the building, and concerns remained about the floor tiles and ceiling. In 2009, the village pursued a grant to demolish the old buildings, and an auction was held to sell off some of the odds and ends such as chairs, a scoreboard, slates and more. Wesley said all of her family, and her husband's, went to the Flat Rock School, as well as her children. "I have got a couple of exit signs. We cleaned them up and put them in the kitchen. They're really neat," she said. "We have that to remember it by."